Stan Laurel was born in England to an actress mother and comedian father. One night early in his own stage career, as he returned to the stage for an encore, he dropped his silk topper hat and, as it rolled toward the footlights with him in pursuit, he accidentally kicked it into the orchestra pit. One of the pit musicians, in trying to retrieve the hat, inadvertently stepped on it and thoroughly squashed it. Dashing of the stage, Stan caught his coat on a steel hook, the coat ripped apart and the audience howled with laughter. His career as a comedian had begun. Oliver Hardy was born in Georgia. 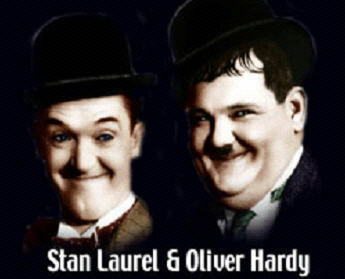 Unlike Stan Laurel, Hardy�s parents were not in show business. His mother operated a Hotel, where Hardy developed the habit of observing peoples� movements and mannerism. This served him well when as an actor he was called upon to portray a wide variety of characters. Laurel & Hardy began working together in the late 1920�s. By then each had 20 years of experience behind them, and when the two joined forces, the result was hilarious. The twenties and thirties would not have been the same without the madcap antics of Laurel and Hardy.